Securing your own domain online is as simple as choosing a domain name and paying the appropriate fees to register it. But, in some cases, the way to get the perfect domain for your brand or business is to buy one that already exists. Expired domain names are available for anyone to buy, but if your sights are set on one that’s currently in use, you’ll need to find out who owns that domain in order to contact them about buying it. 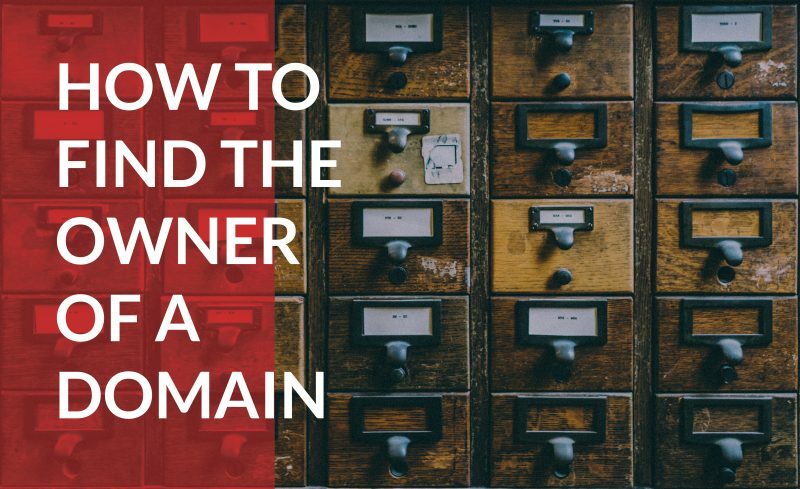 With the help of online domain owner lookup tools and some research, you can find out the legal ownership of a domain—including your own. Why search for a domain owner? The most obvious reason to locate a domain owner is to try to purchase the domain, but that isn’t the only one. If a site claims to be a legitimate one owned by a major corporation but appears suspicious, checking its ownership is a way to verify its authenticity. Likewise, if a website has no contact information on its homepage or a contact page, a visitor could track down its owners in order to contact them with questions about the site’s products or services—or to report a technical problem. Another reason to check domain ownership information is to safeguard the security of your own site against incorrect or incomplete contact information. Looking up the domain ownership records on an existing site allows owners to ensure that their information is correct and that nothing has been changed without permission. Searches for domain ownership can be accomplished through public WHOIS databases, website searches, and even email, depending on the reasons for conducting the search. Who legally owns a domain? Searching for a domain’s owner can turn up multiple names provided as contacts for functions such as technical support, administration, and billing. But, the legal owner of a website is the registrant—the person or entity in whose name the domain has been registered with a dedicated domain registrar or hosting provider. As long as registration fees are kept up to date, that owner retains full rights to the domain and has sole control over selling it at any time, whether or not the domain is nearing expiration. Many websites ranging from personal blogs to larger business and professional sites include information about the domain’s ownership, and offer obvious ways to contact a domain’s owner either right on the site or through a related email address. The most direct way to find out a domain’s ownership is through a search of WHOIS databases, which provide detailed information on the current ownership of websites of all kinds. WHOIS databases are available through entities such as WHOIS.net and ICANN (the International Corporation for Assigned Names and Numbers), an organization dedicated to coordinating and storing information related to each unique website in the world. Different WHOIS databases offer varying amounts of information about a particular site, but any version a searcher uses provides essential data such as the name and contact information of the owner/registrant, and the domain’s term and expiration date. Some WHOIS lookups also include more detailed information about the domain itself, such as statistics related to site performance and traffic. Others include not only a domain’s current information, but also a history of past ownership, domain renewals, and other information. Searchers may also be able to see a list of other sites owned by the registrant, each of which can have its own contact information and a potential path back to the owner. WHOIS lookups have limitations, though. Privacy seeking domain owners can thwart searchers by using proxy registrants—companies or entities that appear as registrants, so that the actual owner remains anonymous. Contact information such as email addresses can also be out of date or no longer in use. Users can also add privacy features that cloak personal data to outside searchers. Those obstacles can sometimes be overcome by searching the domain’s ownership history to find information that predates privacy settings, or by searching an owner’s other listed sites for more current contact information. If current ownership information is not available through a WHOIS database or not directly shown on a site, it may be possible to track it down through other kinds of information, such as social media profiles or links to related sites. For example, a searcher might find the site owner through a Twitter account or LinkedIn profile, even if that information is not on the domain or in a WHOIS database. Even a Google search might turn up clues to a domain owner’s identity and contact information. Buying and selling domains is an industry all in itself, and a number of services exist to make those transactions possible. If all efforts to find a domain owner through WHOIS or other strategies are fruitless, a domain brokerage or agent may be able to help. These entities offer services that range from locating an elusive domain owner to managing all aspects of a domain name sale. Sales of desirable domain names can be expensive, and brokerages also have their fees, but companies searching for just the right name to promote their brand may find these services well worth the investment. The right domain name enhances your visibility and promotes your brand, but that perfect name may belong to someone else—and locating that person can be the first step toward securing the domain for your own use. Checking ownership of a domain can help keep your own domain secure and up to date, as well. With the help of online search tools such as WHOIS and a little detective work, it’s possible to find any domain’s legal owner—or to protect your own domain’s essential information.